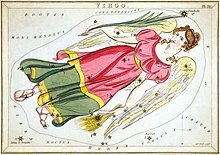 In the Poeticon Astronomicon by Hyginus (1st century BC), Parthenos (Παρθένος) is the daughter of Apollo and Chrysothemis, who died a maiden and was placed among the stars as the constellation. Diodorus Siculus has an alternative account, according to which Parthenos was the daughter of Staphylus and Chrysothemis, sister of Rhoeo and Molpadia (Hemithea). After a suicide attempt she and Hemithea were carried by Apollo to Chersonesus, where she became a local goddess. Strabo also mentions a goddess named Parthenos worshipped throughout Chersonesus.